Alright, there are some serious competitors for that title, even if we limit ourselves to books on the cold war era. Notably, Witness by Whittaker Chambers is a more literary, though less learned, revelation. Yet beyond the hyperbole (courtesy of Miss Coulter) there lies a kernel of truth, or at least an application of the marginal utility theorem. Unless you have, Blacklisted by History: The untold story of Joe McCarthy is the most important book that you have not yet read on American politics. Indeed, it bears some faint likeness to the Bible, in that it centers around a resurrection, albeit in this case the resurrected reputation of a man who has been damned repeatedly by the Pharisaic court of American establishment history. Like a Biblical epic, this damnation of Joe McCarthy transcends the fate of any particular man, however laden with interesting vices or admirable virtues. Rather, this verdict has shaped the moral and legal precedents which have become the rotting core of modern America’s extra-constitutional political framework. McCarthy and so-called “McCarthyism” (a term which is taken as synonymous with “witch-hunting”) have become the bywords and shibboleths of partisan conflict within our body politic, entailing the suppression of ideological meaning and accountability. Indeed, the very contours of American history since WWII have been distorted through the astigmatic lens of Anti-McCarthyism, a standard narrative by which we presume to distinguish not just right from wrong, but left from right. Yet, what if the standard narrative were itself wrong? What if, instead of an ogre, Senator Joe McCarthy were a mid-20th century Paul Revere, cruelly shot off his horse while attempting to warn his fellow citizens of a stealth attack on their freedom and fortunes? What if the opprobrium of “McCarthyism” were a better characterization of the malicious and deceitful tactics of those who sought to thwart McCarthy’s investigation and subsequently endeavored, with near total success, to destroy his reputation? If we are to believe M. Stanford Evans (1934-2015) the answer to all these questions is in the affirmative. Moreover this is not just an impassioned cry by the late Evans, who as a libertarian and anti-communist might be expected to favor “tail gunner Joe”, but a measured verdict drawn from the vast amount of relevant empirical evidence which had become available by the time he started doing research for Blacklisted by History (2007). This work stands at the apex of Evans’ long labors in the field of American political history, during which he was able to sift and reassess much of standard cold war narrative. The currently available evidence, together with Evans’ skillful unraveling of the historical incidents which impacted McCarthy’s investigations, has newly empowered the pro-McCarthy narrative. Yet even today, or rather especially today, truth telling is not a safe occupation. Perhaps some future Oswald Spengler will pronounce the first half of the 1950s and the last half of the 2010s as the upper and lower harmonics of the same historical chord, or discord. Evans termed the McCarthy story “the third rail” of cold war history, containing dangerous truths which, once grasped, might prove fatal to apprentice historians who long to stay respectable, employable, and keep up relations with polite society. Fortunately Evans had the courage to grab the story and explore it with solid documentation and readable prose. Hence today in the Trump era, as we labor under corresponding tales of deceit and betrayal, we can at last draw on the analogous events of a highly relevant historical period for our intellectual ammunition. In the long run, Americans and all humanity have a vested interest in the vindication of truth, however distasteful such revelations may prove to be. Where such revelation is rendered impossible, factions will be reduced to those modes of conflict resolution where the ammunition has ceased to be intellectual. Much of the value, and readability, of Blacklisted by History stems from the late Evans’ patient work as a re-educator, explaining the forgotten historical context of the cold war era, without which we can hardly form an intelligent judgement on its politics and policies. The fact is, regardless of political opinion, that era, though within living memory, has become a persistent blind spot for the American public. There are two reasons for this historical amnesia, the first being the conspiratorial motives of those who want the whole period either distorted or dropped down the proverbial memory hole. However the public’s understandable distaste for an ugly era is perhaps an even greater factor. American history nerds who can rattle off the precise number of musket balls embedded in the soil of Gettysburg are likely to profess astonishment on learning there were Soviet moles embedded in Washington just sixty years ago…not to mention before or since. As Evans notes, the fruit of this ignorance (whether willful or on account of deception) often leads to ridiculous error, like the popular image of SenatorMcCarthy chairing the House Un-American Activities Committee (HUAC). After all, you may not like the Electoral College, but you can hardly abolish bicameralism, at least not retroactively. Evans begins by recounting the historical background which gave both meaning and impetus to McCarthy’s political mission. Prior to some indefinable tipping point, possibly as early as the German defeat at Stalingrad, the synergy of the Soviet-American military alliance was nudging the two societies in the direction of an insidious moral convergence. One concrete manifestation of this was the participation (at the time not considered infiltration) of Communists in the intelligence and foreign services of the United States. Evans notes that it would have been miraculous if there had been no Communist personnel in key governmental positions, given the political dynamics of the period. However all this changed with the onset of the cold war, after which Communist staffers were considered, quite rightly, to be a security risk. During the immediate post-war period two broad developments occurred which were to have significant impact on the subsequent “McCarthy era” of 1950-1954. First there were a series of preliminary investigations which identified, and presumably routed out, known Communists working for the American government. Second, there was a changing of the old guard in the diplomatic and intelligence services, with stodgy conservatives being replaced by younger, more progressive, officials. The new guard included such rising luminaries as Dean Achenson. These two developments (the termination of the early investigations, and the rise of the new guard) would prove to be somewhat more than coincidental. Two years after these preliminary investigations had been concluded, Senator Joe McCarthy raised the question of whether Communists were still being employed in sensitive government positions, issuing his challenge at first in a speech given in on February 9, 1950 in Wheeling West Virginia. Clearly, the salient assumption in McCarthy’s mind was that the preliminary investigations had somehow been stalled, and the work which had commenced with great earnestness had at some point been broken off and left incomplete. It is equally clear that, for whatever reason, certain people in the State Department and other agencies of the government didn’t want the issue of Communists working in the government reopened in public fora and, from the moment that McCarthy began speaking out, launched efforts to discredit his claims. For the next several years a titanic battle waged over security and espionage in the Congress, the courts, and the media. During these conflicts “tail gunner Joe” won some and lost some, but in the end was forced to retire from the field of battle in disgrace. For several subsequent decades the moral credibility of Joseph McCarthy was generally ranked on a par with the divines of the Massachusetts Bay Colony in the aftermath of the Salem witch trials. However during these same decades, new archives and records have been made available to researchers such as Evans, frequently containing evidence which have compromised the exculpatory claims of McCarthy’s opponents. Foremost among these are the Venonadocuments. These are deciphered messages from the correspondence between Soviet intelligence headquarters (predecessor agencies of the KGB) and its operatives. Actually cracked early in the cold war, this data could not be released during the “McCarthy era” for the same reason that the Enigma machine decodes could not be revealed until the Axis powers were defeated. The personae mentioned in Venona bear a damning resemblance, not just to such celebrated Soviet assets as Alger Hiss and Robert Oppenheimer, but to many lesser targets of McCarthy’s investigations. Apart from, and corroborating Venona, were piles of documents made available after the dissolution of the Soviet Union in 1991. Last but not least were the dribs and drabs of documentary evidence released by the FBI and other alphabet agencies of the American government after their various statutory periods of sequestration had expired. From these sources and others (i.e., retrospective witnesses and confessions) a very different image of the “McCarthy era” has emerged, and it is from these that Evans has assembled the most through vindication to date of the much maligned senator. At the beginning of the 1950s the Democratic party was still in control of Congress, and in response to the allegations which McCarthy had been making since the Wheeling speech, a select sub-committee of the Senate Foreign Relations Committee was empaneled to examine the possibility of security risks lurking in government employ. The chair of this sub-committee was Millard Tydings (Dem-Maryland) who from the outset of the proceedings assumed an adversarial stance towards McCarthy and his claims. Rather than pursuing the question of whether there were in fact Communists and Soviet infiltrators embedded within the State Department and related agencies, Tydings focused on McCarthy himself, faulting him for reopening cases which had already been disposed of by previous committees. Tyding’s overall strategy was to portray McCarthy as a hothead and a dissembling researcher who had failed to turn up any new evidence since the previous investigation of security risks at State. That previous investigation, conducted in the late 40s, had managed to generate a list of persons considered security risks, called the “Lee list” after the clerk responsible for assembling eighty or so cases. This was a masked compilation of data in which the persons described were designated by numbers rather than names, preserving their privacy. Tyding’s initial strategy was to trivialize McCarthy’s claims by insinuating no new research had actually been added to the Lee list by McCarthy and his staff. Since names were not mentioned at the outset, identifying how many security risks McCarthy had uncovered, rather than who they are, became the focus of inquiry. This derailed the hearing into a ludicrous debate on the number of people under investigation, with Tydings and his allies focusing exclusively on the number (was it 57 or 81 or 108, or did it keep changing?) rather than the substance, of the charges. All of this, of course, for the purpose of making McCarthy look like a fool who couldn’t even keep the accurate number of cases straight in his head. The possibility that there were still active Communist cells operating in government employ took a back seat to debates over McCarthy’s competence and character. As bad as such misdirection might be, as Mr. Evans reveals, there was worse to come. Today our politically correct language virtually equates “McCarthyism” with slander. Yet Senator McCarthy’s initial intention was to preserve the anonymity of his cases to avoid any stigma being attached to possibly (though unlikely) innocent individuals. However, with the validity of McCarthy’s research in question, Senator Tydings pressed him to reveal the identities behind the cases, presumably in order find out if new and ongoing security risks had been uncovered, or if McCarthy was just trying to ride to glory on the back of the now stale Lee list. Evans, with the benefit of historical retrospect, informs us that McCarthy had indeed uncovered a significant number of new cases and data, and furthermore that many persons initially placed on the Lee list were still in government service. However, at that time, McCarty was under tremendous pressure from Tydings, and consented to release the names at the outset of the investigation, proving that there were indeed real persons connected with the suspicious, but hitherto anonymous, case histories. Thus McCarthy evaded the ridicule of conducting a snark hunt only by putting his investigation in danger of being called a witch hunt. Hence, as Evans painfully demonstrates, the cruel Inspector-Javert-like persecution which we wrongly denominate “McCarthyism” was initiated by this unmaking of identities upon the insistence of Tydings and his allies on the sub-committee. Indeed, if our language accurately memorialized historical realities, we would be calling this kind of hounding “Tydings-ism”! The procedure adopted by Tydings was that of slandering the innocent (McCarthy himself) or one might say “McCarthying” (here the term is apt!) his opponent. However in terms of outcomes, this Tydings-ism, rather than convicting the innocent, protected the guilty. Even unmasked, the targets of McCarthy’s accusations were generally able to deny the charges, either through skillful evasion or invoking the Fifth amendment clause prohibiting self-incrimination. In the meanwhile many of them continued to work in their government positions. In hindsight, theVenona transcripts and other corroborating evidence indicates that many, if not most, of these were Soviet agents. To maintain that no innocents were convicted at the time is not to say that, as a result of the miscarried proceedings, great and incalculable harm was not done to many innocents, however indirectly. Hence Tydings and his allies nearly succeeded in obscuring the actual security issues involved, deflecting the investigation with procedural, technical, and ad hominim material which resulted in a committee report which largely exculpated the targets of McCarthy’s investigations. Evans notes that this report (and others of a similar nature) was written by a then-anonymous staffer at the behest of Tydings, and its unequivocal findings did not accurately reflect the give-and-take of the bipartisan sub-committee. So ended the first “round” in the McCarthy era battles. Tydings was soon to get his comeuppance when he lost a bid for reelection to his Maryland seat. Yet during the process of the Senate investigation a broad range of institutional actors had been brought into play, ostensibly to cooperate with, but more often to hinder, McCarthy’s investigations. These included Truman’s White House and the State Department. The FBI, then under J. Edgar Hoover, was savvy to the truth of McCarthy’s claim that espionage within the government had managed to survive the investigations which had generated the Lee list a few years earlier. However the FBI was largely sidelined due to its subordination within the executive branch teamed with an often adversarial legislative branch. Indeed, with so many (and such opaque!) agencies, actors, cases and claims involved, the McCarthy era is difficult to resolve into a simple narrative. Thus the unbiased but superficial observer of the era is likely to turn away, citing the tangle as an excuse for moral indecision. However Evans copes with the complexity by taking up each cluster of actions, organizations, individuals and outcomes separately, weaving each thread into a loose chronological order. It is the task of the reader to keep this overall chronology in mind, as each strand of narrative weaves into and reinforces the other. The end result is a unity and a vindication. Not necessarily a vindication of McCarthy the man so much as of the essential rightness of his cause. Many of the narrative strands which Evans picks up for the edification of today’s reader concern well recognized institutions and personalities of the WWII and cold war eras which have since dropped below the horizon of public recollection. Outstanding in this regard was the notorious Institute for Pacific Relations (IPR) and its associated journal Amerasia. both of which operated as poorly disguised Communist fronts. This is one of the major strands woven back and forth within the chronological framework of Blacklisted by History, in such a way as to illustrate the intimate connection between blatant Communist propaganda and the manipulation of American foreign policy during the 1940s. The often cited (by Evans) Amerasia case is a good example of the kind of evidence which should have been common knowledge among McCarthy’s contemporaries, as opposed to the kind of evidence (like Venona) which we are only privy to in historical retrospect. Thus, while we are on firmer grounds today than ever before in validating McCarthy’s claims, those claims ought not to have initially outraged his contemporaries since they were made against the background of, and links to, cases of betrayal and infiltration which had already received public censure. Rather, any skeptical reception of McCarthy’s claims about ongoing espionage and sedition within the government had less to do with the plausibility of the cases, than with obstruction by gate-keepers who both withheld information from the investigations and harbored their targets from any severe sanctions. This obstruction took a number of forms during the period of the Tydings investigation. First of all, under Truman, a doctrine of executive privilege had been promulgated, which placed severe restrictions on the ability of Congress to subpoena documents from executive departments without the authorization of the President. For those of us who interpret the Constitution as a document establishing the supremacy of the Congress, this seems like an odd practice. None the less, under ongoing conditions of war (both cold and hot) the American people and Congress itself have long acquiesced to executive prerogatives which seem contrary to constitutional principles. In this instance, as detailed by Evans, background dossiers on the subjects of McCarthy’s investigations were either embargoed or delayed by the State Department, which pleaded the necessity of authorization by the Truman White House, a Democratic administration which was in no rush to grant any such authorization. Another way in which the Truman administration ran interference to McCarthy, albeit in place prior to the Tydings hearings, was through the institution of an in-house loyalty system which seemed to obviate the necessity of any outside audit of executive personnel. As Evans documents, both the Congressional interviews with suspect officials and, presumably, the in-house loyalty system, were based on the honor system. A denial that one were a subversive or the agent of a foreign power was always taken at face value by Tydings, the majority report, and the Truman administration itself. None the less, in spite of vigorous opposition on the part of a Democratic establishment, McCarthy was able to raise public awareness of the espionage threat. One by one, the more egregious cases on McCarthy’s list were exposed and turned out of the government. Of course, the anti-communist momentum in Congress and the country wasn’t an exclusive result of McCarthy’s efforts. Alger Hiss, the biggest fish in the barrel, had been brought down by the testimony of Whittaker Chambers with the support of a young Senator from California, Richard Nixon. In those days Nixon was still a hero, and his time of demonization was still far in the future, but McCarthy’s nemesis was much closer at hand. Initially McCarthy benefited from the common front among Republicans, then operating as a minority. Thus even future enemies such as liberal Republican senator H. Cabot Lodge were in momentary alliance with McCarthy during the Tydings period. Apart from the success or otherwise of the PSI at the start Eisenhower era, at this juncture the bitter divisions between ideological and establishment Republicans were starting to manifest themselves publicly. In part this was a reaction to McCarthy’s activities, and would soon would lead to dire complications for the crusading senator. Furthermore, a dedicated anti-McCarthy cabal was growing in numbers and sophistication, with the senatorial cudgel taken up by the newly elected Benton of New York after the defeat of Tydings. With the Democratic recapture of the 84th Congress, Benton was able to launch his own counter-investigation of McCarthy. This counter-investigation did not restrict itself to the refutation of anti-communist claims, but began to burrow deeply into McCarthy’s private affairs and character. Brick by defaming brick, the towering mythology of “McCarthyism” was being patiently constructed by the enemies of McCarthy. A surprising plus for McCarthy, albeit one which failed to save him in the long run, was his capacity for genuine bipartisanship. As an anti-Communist first and a Republican second, he welcomed allies wherever they could be found, and find them he did. There is nothing more shocking to modern political sensibilities than to discover that the Kennedys, Democrats to the core, were ardent supporters of tail gunner Joe in his heyday. Undoubtedly, today’s identity-obsessed left would dismiss this as no more than Irishmen scratching each others backs. Yet, in those days there were plenty of Irishmen in politics, but not so many political philosophers, let alone potential martyrs. There appears to have been some zealous affinity at work here, especially between McCarthy and the solidly anti-Communist Robert F. Kennedy. To Evans’ credit, the Kennedy connection isn’t used as a magical vindication of McCarthy. Tail gunner Joe’s reputation must stand or fall on the basis of whether his investigations were honest and beneficial to the republic, not on the borrowed glamor of charismatic associations. Regrettably, any excursion into Kennedy lore entails a certain amount of tabloid voyeurism, but Evans keeps this to the minimum, focusing on the unavoidable intra-staff jealousies which played a subsidiary role in derailing McCarthy’s career. More importantly, the point in history when McCarthy-saffer RFK was striving (unsuccessfully) to be McCarthy’s right-hand man, was still an age of aspiring ideologists. Later, as America ripened into an age of propaganda, principles would become less important than personalities, and a steamy mysticism would envelop chosen political bloodlines. Evans draws our attention the disturbing power of this myth-making, which took as its substance two zealous co-workers in the garden of justice, Robert Kennedy and Joe McCarthy, molding them into opposing icons of good and evil. As the battle lines were drawn with increasing precision, the tendency was for individuals and groups to defect from the pro-McCarthy camp, and for previously uncommitted groups to opt in favor of the anti-McCarthy front. Notably, certain persons connected to the armed services, which at the beginning were not affected by McCarthy’s crusade, became increasingly critical of him as his investigation broadened into areas the military considered its own. Regarding his taking on of the Army, there might be some, however sympathetic, who would claim McCarthy’s crusade went a bridge too far. Yet as Evans points out “Army-McCarthy” taken as terms of opposition, is a misnomer. In the wake of security concerns being brought to the attention of McCarthy’s committee, he authorized an investigation of the huge Signal Corps facility at Monmouth NJ. Initially things went smoothly in cooperation with on-site Army personnel, who were generally enthusiastic about the senator’s support of their own internal security investigations. However McCarthy quickly ran afoul of a supervening bureaucratic apparatus charged with monitoring loyalty within Monmouth and other facilities. As soon as the commandant of the Monmouth facility was blackballed for cooperating with McCarthy, the commander of the next base under investigation suddenly became uncommunicative. Apparently some network operating within the Eisenhower administration was running interference. The next obvious step would have been to ferret out and identify the higher ups who were shielding the Monmouth moles. This was never done. Not, to be sure, for want of trying on McCarthy’s part. A number of factors contributed to this inability. Foremost among these was the penchant of his enemies for countering investigations by McCarthy with investigations of McCarthy and/or his staff. Evans enumerates a minimum of five separate instances where hostile inquiries were instituted against McCarthy 1) the Ad hominum attacks which diverted the Tydings probe, 2) hearings by Benton (pinch-hitting as chief nemesis post-Tydings) on allegations that McCarthy’s allies had influenced Tydings’ electoral defeat, esp. concerning one particular libelous image (what we would today call a “meme”) , 3) a spin-off of the same hearing which made a lengthy foray into McCarthy’s personal finances, 4) the Army-McCarthy hearings, 5) hearings by Sen. Watson (R. Utah) on McCarthy’s misconduct on 47 counts which resulted in censure on 2 counts. Of these, the most formidable sounding are the Army-McCarthy hearings. However as Evans tells the tale, it smacks of harassment (by unknown somebodies) of McCarthy’s staff. G. David Schine, a youthful staffer, was suddenly called up for military service. This sounds cruel by the sensibilities of any era post-Vietnam, but even by the compulsory standards of that time it was a fishy move. People working in sensitive positions (like congressional security investigations) were frequently granted draft deferments. Furthermore, as the skeptical Evans is quick to point out, nefarious bigwigs such as the youthful Alger Hiss had been exempted from conscription during WWII, enabling them to do their country (dis-) service in other fields. Thus the staffer’s drafting smacked of a gambit in which a McCarthy pawn was being put in jeopardy in order to exert pressure on the senator and his investigation. Unfortunately another staffer (Roy Cohn) took the bait and began pestering the Army on behalf of his erstwhile colleague, whether for deferral or promotion or either. This was portrayed as political interference with on-duty military personnel. It was this petty and misdirecting affair which formed the basis of the Army-McCarthy hearings, and which managed to distract and irritate a senator in mid-investigation, a veteran himself, who had initially tried to enter into an alliance with the security hawks of the armed forces. Of necessity, Evans goes into the matter in great detail, but this becomes less a history of the cold war than a history of the degeneration of policy debate into tabloid journalism. Although inconclusive, the Army investigation served McCarthy’s foes well, forcing him on the defensive and evoking his ire, consequently viewed as intemperance. The same distortion and sensationalism which hounded McCarthy and his staff were also impeding his own attempts at rooting out Communist agents in the military and the government. Evans covers all the highlights of the various investigations, not just those of the PSI but those in which McCarthy himself was the target. More importantly, he explores the context within which famous testimonies were made, context without which excerpted highlights serve only to confuse and malign. After the censure McCarthy was shunned, his effective career ended. He died, as they say, a “broken man” at the ripe age of 48, disheartened but still in harness. After a mid-term election William Proxmire (Dem-Wisc.) a veritable photographic negative of everything Joe McCarthy ever thought or did, gained his seat in the senate. It might be said that if ever someone had lived in vain, it was old “tail gunner Joe.” Of course, that is precisely what the authors of the mainstream narrative want you to think. However the reality is far more complex, and it is gradually being articulated by dissenting voices, among whom M. Stanford Evans is thus far the most readable and convincing. Perhaps you, having read my summary article, find yourself intrigued with this fallen hero of anti-Communism, or conversely, it may be that you cannot shake the impression that Joseph McCarthy was a moral monster. 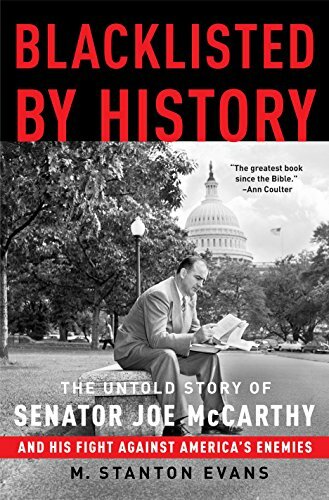 In either case, I urge you to fortify your knowledge by obtaining and reading Blacklisted by History: the untold story of Senator Joe McCarthy. I think you will find the late Evans a safe and trustworthy guide into the underworld of cold war history and the McCarthy era, and not only because the book is voluminous and packed with footnotes and hints for further research. I trust this book because it is the fruit of a lifetime of investigation into the invisible war between freedom and its cruelest enemies. M. Stanford Evans ran the gauntlet of 20th century scholarship and journalism, scion of the heartland (Texas) yet Ivy league grad (Yale), conservative activist and journalist, he knew his sources and their backgrounds with the immediacy of an insider who was a political outsider. Most importantly, the theme of his work is not trivial. It is not trivial because, as literary anthropologist Rene Girard has taught us, all regimes are built on the bones of scapegoats. In many ways, the nuances and taboos of American politics are dependent on a negative evaluation of the McCarthy era. Now that, for better or worse, the Trump administration shows signs of violating certain of those taboos, it is important that we reexamine the origin of those taboos in the past. This is not a matter of whether one approves or despises the present administration, it is simply that the course of events are forcing us to ask questions which were long left dormant. One very non-trivial issue concerns how the doctrine of separation of powers should affect the transmission of information within the government. A study of the McCarthy era reveals that the present virtually hermetic seal between the executive and legislative branches is neither an artifact of the constitution, nor a holdover from wartime secrecy, nor even a promulgation of the security state and its notorious “three letter agencies.” Surprisingly, it turns out to have much more to do with “gag orders” instituted by the New Deal administrations to obstruct prying by the Dies and McCarthy investigations into security matters. Even more surprisingly, this informational firewall between the branches was continued and reinforced by the Eisenhower administration, and for much of the same reasons. You don’t believe me? Read Evans. Which leads us to the final consideration, did McCarthy actually live in vain? Of course not, and Evans devotes the postscript of Blacklisted by History to an enumeration of our ingrate inheritance from tail gunner Joe, that alleged ogre. Without belittling the long list of secret and not-so secret agents who were turned out of their top-secret clearances, it seems to me that the salvation of much of Asia is the most relevant legacy which we can celebrate today. Imagine a world without a Taiwan or a South Korea. True, it may come about in the near future, but it was scheduled to come about in the 1950s. I don’t refer to the very understandable cupidity of a Mao or a Stalin, but of the ideologues embedded in the IPR and Amerasia who had the power, at a perilous moment in history, to turn off the spigot of American support. Admittedly, McCarthy was not alone in preventing this, but he was part of the essential follow up. You don’t believe me? Again, read Evans. In conclusion, I must apologize for comparing a profane (although gentlemanly) work to Holy Writ. Allow me to explain that there is an extenuating circumstance, apart from merely seconding the redoubtable Miss Coulter’s opinion. Evans concludes with the Biblical analogy of Samson bringing down the temple of the Philistines on his own head, and likewise the untamed McCarthy, whatever his subsequent reputation, was effective in causing a great deal of collateral damage among the enemies of freedom. It is an analogy drawn, appropriately, from the Book of Judges. At last in Evans’ book we may have a valid judgement of McCarthy’s work, and of blood which cries out from the ground, not just for vindication but for succession and continuation.